NEW BEGINNINGS-IT TAKES COURAGE TO CHANGE ©: DO YOU HAVE A TRUST FUND? Greetings to you In the name of Love, my friends in Christ! Are you counting your blessings or your problems? Do you have a Trust fund in God? When you have a Trust Fund in the name of Jesus that God watches over, it does not matter what happens in the natural world—you can dip into your trust fund and receive everything that you need for the moment. The presence of God changes everything. This is some of what is in my Trust Fund in God. His constant presence that I seek and sit in daily. As I sit, watch and listen to the workings of the enemy come to pass, I fully understand that to have trust in God in Jesus’ name, is the best investment I could have made and to continue to make daily deposits into my trust fund with Him is what will Keep me and my family in His Will for us. To know that no amount of money, effort, genius, education and training will accomplish anything worthwhile and long lasting without the presence of God in the middle of it; is exactly what is keeping me in the midst of His peace as we are witness to what greed planted and watered and grew. The weed of greed and evil has planted a large crop and now the harvest is upon those that invested their time, heart, trust, love, body, faith, and all natural bounty into it. Look at what kind of return they are receiving for being obedient to worldly investments. I pray for the deliverance of all the people caught up in the works of satan to steal their Joy and Happiness. They have been tricked, hoodwinked, and bamboozled into investing all they are and have into satans devious plans. All to obtain riches that will tarnish and fade. Lord I do ask for Your mercy for these people, in Jesus name, amen. In the presence of the LORD, you will receive His peace, His wisdom and His understanding as He teaches you to know Him and His will for your life. God has taught me that with His presence in the center of each situation, circumstances changing are assured! When a person has been in the presence of God – been tried, refined and made true—saturated by Him that Is love; the person Will come away experiencing the change to see from a different view—which is defined by a higher hope, fearless confidence and a deeper trust in our Father. By doing this, you are saying to Father, not my will Lord, but Thy Will Be Done! Daily worship with God, will now feed this experience of knowing His presence and knowing how to call upon His presence. You will strengthen the vision and increase in faith to do without hesitation All the will of God for your life. I encourage you to call on His presence, sit with Him to grow your personal relationship with God through Jesus. This is what daily praise and worship is all about. To honor Him with our hearts, mouths and daily living so that we will relay upon Him, lean upon Him and trust in Him fully, no matter what we see around us. To know and trust that our Father has in the name of Jesus, prepared our way of ascending and that this will certainly progress our climbing by way of understanding His purposes for us. To understand that He is stirring the hearts of those who have ears to hear, and eyes to see and the hearts to understand that Trust and Faith are the tools that will most help in times like these. God has already purposed for each of us that receives and accepts His call and directions to stir the coals of our spiritual desires into a flame of power in His Kingdom—that we must deliberately leave behind All things that have been a hindrance to our progression—we are called to remember we have a Trust Fund with God and that right now is the time to Trust and to Know that our Mighty Father Will Continue to lead us forth in Great Triumph as All Glory and Honor will be unto Him through our lives. When what we see with our eyes contradicts what we believe about our Father, this is a moment to exercise our trust and faith, to call upon the purity that we have been blessed with for assurance. This is a time to guard our heart from the lies the enemy will speak against God in order to trick us. And it will work on many a people’s hearts that are not right in their spirits. They are double minded people who one day says they are with the Lord, and the next day say they are serving the enemy. God has already released into our lives Purity. It saturates our lifestyle and preferences, if we are allowing it to do what He designed it to do. Our daily lifestyle is to live our faith—our lifestyles is ‘to Be a witness’ without using words all the time-instead of ‘doing witnessing’ now and then with the wrong heart and spirit. Our daily lifestyle is to believe God-to believe Jesus and to know that we have a Trust Fund with Him. To know that His Holy Spirit will lead us through the good times and the not so good times is part of living this lifestyle—This is what we are to invest in with Him. Invest your trust, faith, beliefs, into your Trust Fund. A lifestyle of Daily Believing which leads to spiritual growth and maturity in Jesus. Thank You LORD, amen. The power of purity allows us to stand, unmoving from the ground of total and complete belief that God Will Do everything that we trust Him to do. 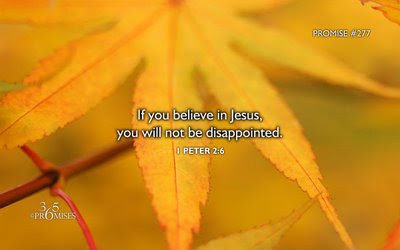 To trust and believe that He will do everything that He said He Will do. This is to be our daily lifestyle as we follow the way that Jesus set forth. Believing God based on the principle of a Pure Conscience one that is undefiled by contradicting points of view is a heart that believes that God is the Only supplier for this life. A place of assurance and trust rooted deeply in His peace is where our conscience is not contaminated by details that contradict what we believe about our Father God. From a pure heart proceeds my belief which stands firm against any disrupting and confusing details that my natural eye may see. God’s wisdom is what my trust fund is built around. A foundation of truth, love, and faith that Jesus is always with me. Amen. I do not make any deposits or invest in any contradicting points of view or opinions based on the worlds offering. This is something that you must consciously focus on daily. The flesh will rise up when you want to be changed by His love completely. And when you work on it daily, your flesh, and your mind will give you reasons and excuses to not obey—to become slack and give in at the times you should remain strong and stand with boldness of truth. Having and keeping an uncluttered heart is a maturity level that He seeks to raise all His children up to. Remember that when you invest in your flesh and the gains of the world, you Will yield a low return if one at all. When your lifestyle is one of double-mindedness, witnessing about His Goodness only when you want to, or when it’s convenient for you—when you invest in lies, and manipulation, trying to be a part of the world and not part of His Kingdom; you will always see nothing for your effort and time given to those selfish ways. When you invest in your trust fund with God, invest in His gifts of the spirit, invest your life in His will and promises spoken over your life you will receive miracles, life saving abilities, strength, purpose, unconditional love, safety, protection, fruits to bear, glory and honor for Him that Is love, and your return will be enough to share with those that He instructs you to help along your way. Focus on and keep a mindset for His love and purpose for your life. Learn to be a witness daily—learn to accept the new lifestyle of believing from His Holy Spirit if you have been washed and baptized by His Spirit and Blood. Investing your time and your best, your worse, your fears, your brokenness, your mistakes, your concerns, your hurt and pain, your love in Him daily, will without doubt create in you Fearless Confidence in Him and yield you a never ending High return and reward right here—right now! To live as A Witness—to live our Faith is our lifestyle, in Jesus’ name, Amen! God Bless You-Each and Every One! in Jesus' name, Amen. Richard Smallwood & Vision - "Be Open"
Richard Smallwood - "I´ll trust YOU"
YOU DON'T NEED TO WAIT-SHOUT NOW!